Too many wc_sessions in WooCommerce? Posted on September 23, 2014 This might be outdated! We have installed Woocommerce in wordpress multisite. Before mapping domain everything worked fine. After domain mapping Add to cart is not working. When we select a product and press add to cart button page gets reloaded and says your cart is empty. When i tried above process by login to the site then it worked perfectly. Issue rises when user add products to their cart without login. I think the problem with cookies or session. Can you please provide me solution to resolve it. Thank you for your all posts (they are all useful). entries. How can I stop these entries? Because they slow down my server. When adding the user agent code to my .htaccess file, I get a fatal error. could you please give more detail on how to properly add this code to the .htaccess file. Clearly he is just as confused as you. That snippet should be placed in a “robots.txt” file in your site root, not your “.htaccess” file. I guess the code for .htaccess was meant for robots.txt. This is a typical robots.txt instruction. So create that file, insert the statement and save it to your webroot. We added the Disallow: /*add-to-cart=* to our robots.txt but noticing that a lot of session are still being created. 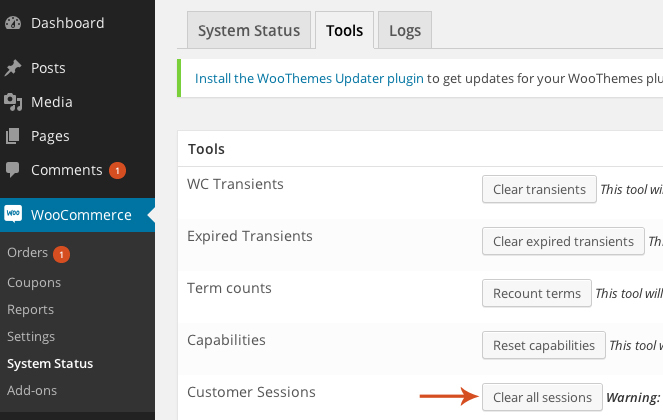 We have the woocommerce wishlist plugin and looks like the sessions are related to that. Right now, visitors have to register on our site to create new wishlists so I’m not sure why these sessions are being created. Any idea on how to stop bots from creating wc_sessions that are related to the woocommerce wishlist plugin?